Mmmmmmm! This recipe is yummy to have any time, but it was so perfect for an Autumn dinner. It’s that combination of sweet and spicy and then topped with fresh herbs. This chicken definitely has a mustard flavor, but I dare say that it’s perfectly balanced (and toned down) with the aid of maple syrup and brown sugar. It cooks for less than 30 minutes and then you top it with the magical power of fresh rosemary! Yeah, I said magical! 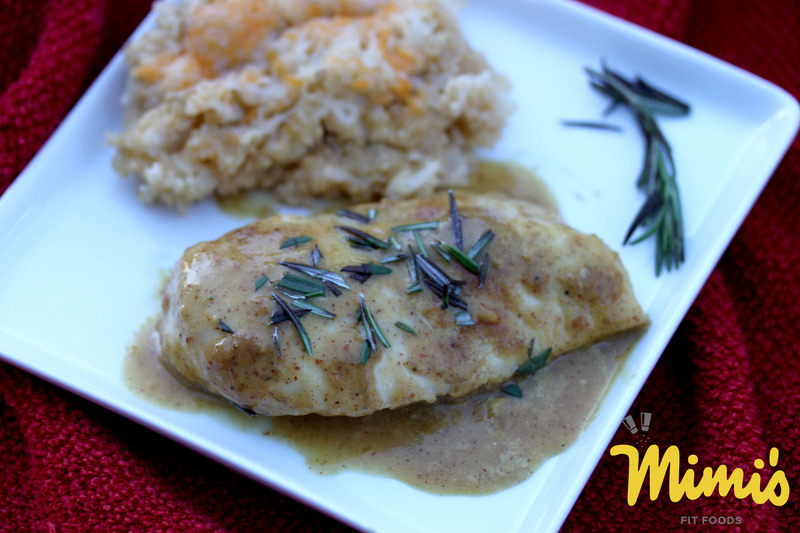 The rosemary makes ALL the difference in this recipe and it’s a MUST! It brings the chicken to an entirely different level . . . . a magical level. When I first saw the recipe I knew I had to try it. Not only were the reviews awesome, but mustard is such a low-calorie condiment. I knew that if I was going to make chicken with a sauce that wouldn’t pack on the extra calories, this was going to be a good one! We ate this alongside Cheesy Cauliflower Quinoa, but it’s simple enough to be eaten with any typical side dish (baked potatoes, rice, etc.). I loved how quickly this came together and I’m guessing we’ll be eating a lot more Sweet Mustard and Rosemary Chicken in the weeks/years to come! Preheat oven to 425 degrees F. Lightly coat a 9×13-inch pan with cooking spray. In a small bowl or liquid measuring cup, whisk together the mustard, maple syrup, brown sugar and red wine vinegar. Set aside. Arrange the chicken in the prepared baking dish with the chicken pieces not touching – just a little space between each. Liberally salt and pepper both sides of each chicken breast. Pour the sauce mixture over the chicken, lifting the chicken here and there to allow the sauce to spread underneath the chicken. Bake for 15 minutes. Remove the pan from teh oven and carefully spoon some of the sauce from the bottom of the pan onto each chicken breast. Cook for 8-12 minutes more until the sauce is bubbly and the chicken is cooked through (will register 165 on an instant read thermometer). Don’t over bake! Just get that chicken perfectly nice and juicy. Remove from the oven and sprinkle with freshly chopped rosemary. Serve immediately.